I've always really hated those cheap water pistols that are impossible to keep from cracking and loosing pressure. And the newer, high powered water blasters are tons of fun, but require lots of help from grown ups to keep refilling them. So what to do when the weather is warm and the kids wanna get wet? 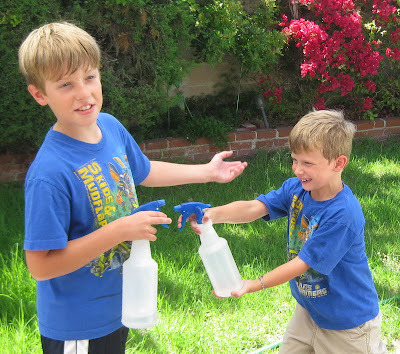 We head to Costco, or Target, or the Dollar Store to pick up a pack of spray bottles, fill them with water and instant hours of fun. You can adjust the nozzle and have a long stream of water or more of a fine mist. 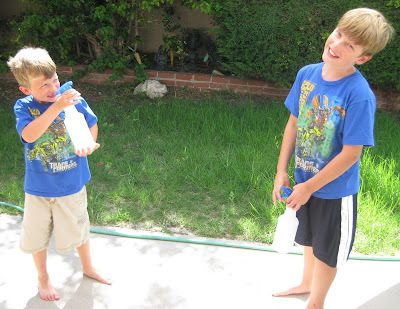 And the best part is when the water runs out, the kids can easily refill the bottles themselves, no help from Mom required! Summer fun for everyone!